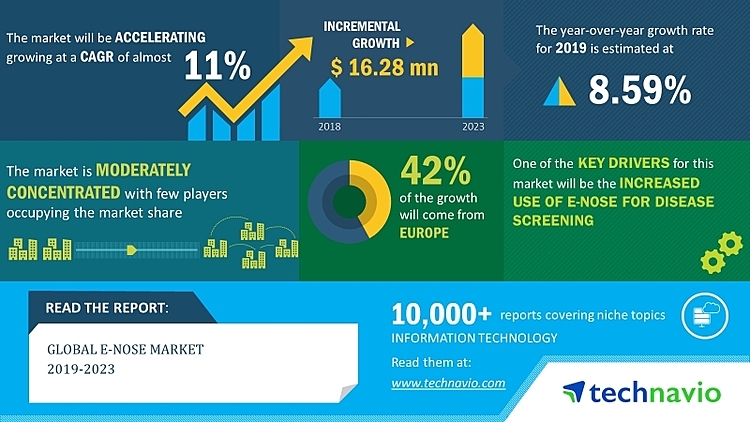 LONDON--(BUSINESS WIRE)--Apr 15, 2019--The global e-nose market is expected to post a CAGR of close to 11% during the period 2019-2023, according to the latest market research report by Technavio. E-nose is increasingly being used to detect disease as it provides valuable information through the examination of exhaled breath. It provides accurate disease diagnosis based on non-invasive detection methods, which helps to reduce the diagnostic cycle. The increased applications of e-nose is encouraging several market participants including researchers and vendors to focus on the development of these devices, Moreover, with the increase in aromatherapy for brain disorders and detection of diabetes, throat cancer, lung cancer, and asthma, the adoption of e-nose devices is expected to increase rapidly during the forecast period. As per Technavio, the development of e-nose chips that can be integrated into smartphones will have a positive impact on the market and contribute to its growth significantly over the forecast period. This global e-nose market 2019-2023 research report also analyzes other important trends and market drivers that will affect market growth over 2019-2023. Earlier, e-nose was primarily used for commercial purposes such as disease screening due to its high cost. However, it is now being integrated into various devices such as smartphones and household applications owing to the development of low-cost e-nose chips. The e-nose-enabled smartphone can perform vital functions such as hazard detection by identifying toxic gas from the air and odor monitoring. Various companies are developing e-nose chips that can be integrated into smartphones. “The adoption e-nose devices is increasing in plant science, material science, and pattern-recognition owing to constant advances in technology. This can benefit the agriculture and forestry industries. E-nose is also used for detecting harmful pesticides in the agriculture industry and in several botanical applications to detect volatile biogenic gas emissions and floral odors. This helps scientists determine and study seasonal variations in plant emissions,” says a senior research analyst at Technavio. This market research report segments the global e-nose market by end-users (environmental monitoring, food and beverage, healthcare, and others) and geographic regions (APAC, Europe, the Middle East and Africa, North America, and South America). The environmental monitoring segment held the largest e-nose market share in 2018. E-nose is increasingly being used in the environmental monitoring industry to assess the quality of the environment, identify toxic wastes, and measure gas emission levels. The sensors present in the e-nose can recognize different gases and detect their odors. The Europe region led the market in 2018, followed by North America, APAC, South America, and MEA respectively. The market in Europe is driven by various regulations and standards developed for the control of odor emission and rising concerns pertaining to waste management.